Addington has added to its collection of trophies with a win at the Canterbury Provincial Championships held in Christchurch. 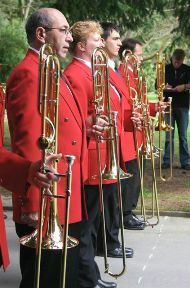 BUGLERS HOLIDAY – ably performed by Ian, Sarah and Rachel Lester on traditional bugles with a little help from the solo cornet team of John Wise, Chris Bull and Pete Gallagher. The rescue of a drowning compere (Ian Lester) by the PADSTOW LIFEBOAT crewed by Rachel and Sarah Lester. A touch of SUMMERTIME from Grant Dempsey on Flugel.